You’ll immediately get an email asking to confirm your email address. Click Yes, Subscribe me to this list. Click the button that says Go to the Google Form>> to access the form. You only have access to view the form. In order to customize it, you’ll need to make a copy. Go to File > Make a Copy, then a box will pop up. Click OK. If you cannot click on Make a Copy, it’s because you’re not logged into your Google account. Go back to step #1. Now that you have a copy of the results spreadsheet, you’ll need to edit the form. Go to Form > Edit Form, then you’ll be redirected to a new page. What did I primarily work on today? What major tasks did I complete? How quickly did the day go? How happy am I today from what I accomplished? I suggest limiting it to these four questions and only customizing your multiple choice responses for the first question. If you’re in sales, you’ll have different standard daily tasks than a social media manager, or a financial planner. Adjust accordingly. And why track time? We’ve all had that experience when we’re caught up in something where minutes turn into hours, then hours turn into “Holy crap, I forgot to have lunch.” Discover what makes you forget to have lunch. Double check that your customized answers are saved by clicking View Live Form. Once you’re happy with the criteria, you’re done editing the form. Now that you’re viewing the live form, bookmark it in your browser. At the end of each working day, you’ll simply click the bookmark and fill out the form. It should only take about 30 seconds. Occasionally you’ll forget to complete the form before you leave work. If it’s bookmarked on your phone, you’re twice as likely to complete it. When you’re viewing the Live Form in your browser (see step #7 above), email the URL to yourself, open your email on your phone, click the link, tap the up arrow in Safari, then tap Add to Home Screen. 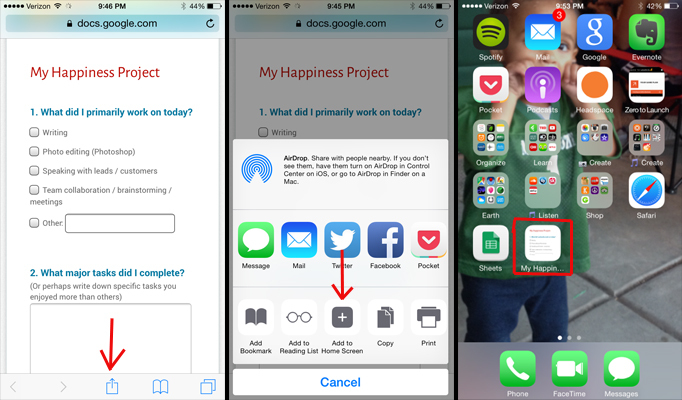 It will now show up as a bookmark on your home screen, looking similar to an app. 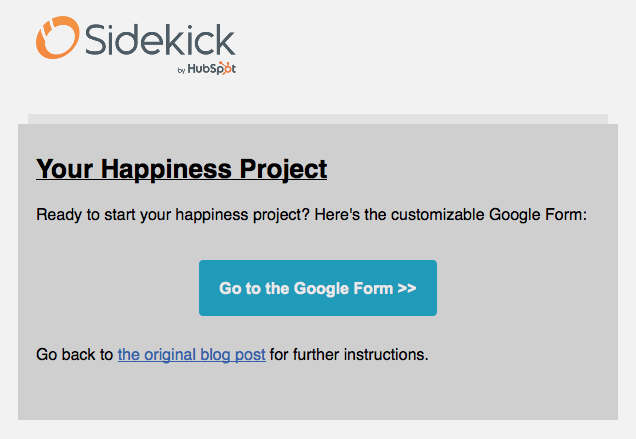 After a few weeks (and months/years), you’ll have enough data to discover trends in your happiness. Of course, the more data you’ve collected, the more accurate your happiness analysis will become. If you’re already talented with Excel or Google Spreadsheets, you’ll know exactly how to extract and analyze the data. 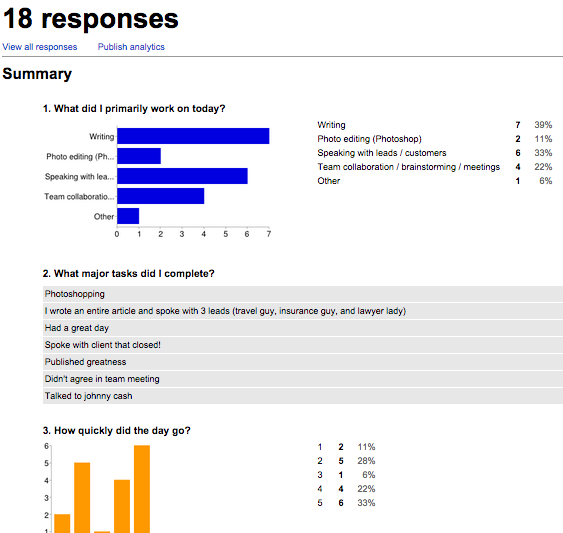 If not, Google Spreadsheets has simple, built-in reporting that easily summarizes responses. 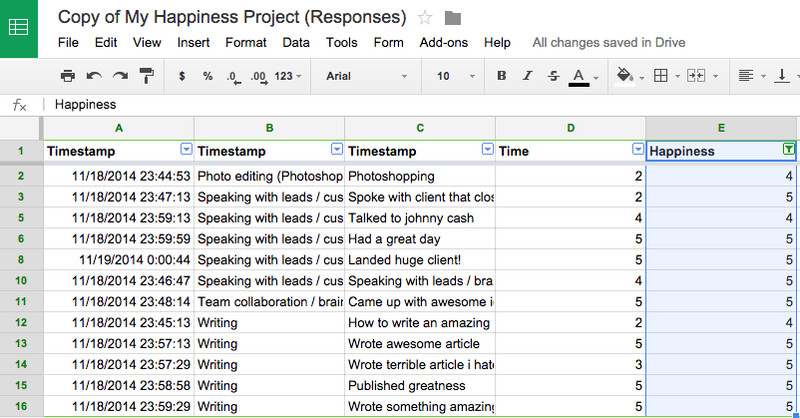 After a few weeks of completing the form, go back to the results spreadsheet (the link in the first Happiness Project email), then click Form > Show summary of responses. It’s pretty straightforward from here – start doing more of what makes you happy and less of what doesn’t. Simple as that. Inspire others in your quest to be a top performer, by sharing data from your Happiness Project on Twitter using the hashtag #MyHappinessProject. Maybe your results will change someones life.